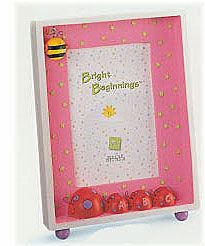 Bee Shadowbox Frame - 9 x 6 1/2 x 1"
Shadowbox Frame - SculptStone with glass inserts. Holds 4"x6" photo. Size (inches): 2.36" X 7.87" X 10.43"
More Photographs - Bee Shadowbox Frame - 9 x 6 1/2 x 1"
End of More Photographs - Bee Shadowbox Frame - 9 x 6 1/2 x 1"